Collisions and mergers occur frequently between galaxies in the Universe. 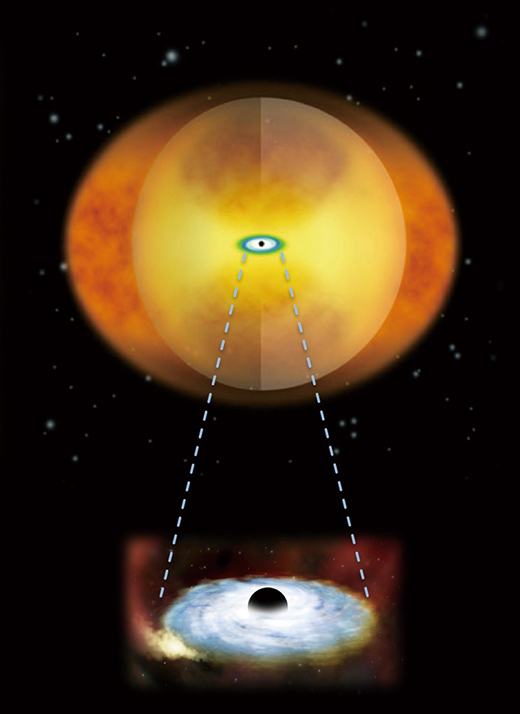 In these collisions it is thought that cosmic dust in the surrounding area becomes warmer and shines brighter in infrared light as a result of intense star formation activity and/or AGN (Active Galactic Nucleus, a phenomena caused by an active supermassive black hole with violent mass accretion). In colliding galaxies where large amounts of gas and cosmic dust are concentrated near the central nucleus of the galaxy in a short period of time, a small-size AGN may be present but cosmic dust will conceal it in almost every direction (Figure 1) . An AGN buried in this manner is extremely difficult to observe and study with visible light. Therefore, in order to correctly evaluate and definitively distinguish between star formation activity and the energy contribution from an AGN buried in cosmic dust, observations at wavelengths with little interference from cosmic dust absorption are essential. Infrared spectroscope observations at wavelengths longer than 3 μm are one of the most effective methods for this purpose. The spectral signature of PAH (Polycyclic Aromatic Hydro-carbon, in which carbon is assembled in the form of benzene) is present in infrared radiation at wavelengths longer than 3 μm. It has been found through previous observations that PAHs are widely distributed throughout the interstellar space of a galaxy. In the case of star formation activity, strong PAH emission lines are observed in the photodissociation region that develops at the boundary between the molecular gas and the ionized zone because the far-ultraviolet photons from the star don’t destroy the PAHs, but instead excite them. In contrast, bright PAH emission lines are not visible for the case of an AGN because PAHs are destroyed by the strong X-ray radiation. Instead, the smooth continuum emission, originating in large dust particles, becomes stronger. If a small AGN is covered with a large amount of cosmic dust, strong absorption features are observed due to the cosmic dust along the line of sight. In this way, infrared spectroscopic observations at wavelengths longer than 3 μm can differentiate between the types of energy sources buried deep within dust. Figure 3 below shows IRCS spectroscopic observation results in the wavelength range 2.8 - 4.1 μm (L band) for two colliding infrared galaxies (Figure 2) with infrared luminosity one trillion times greater than that of the Sun. It is understood from infrared spectroscopic observations that even though colliding galaxies look similar in visible light, their spectral shapes are significantly different. Figure 3: Infrared spectra obtained by the IRCS infrared spectrometer on the Subaru Telescope (Imanishi et al. 2007 AJ 134 2366; Imanishi et al. 2006 Apj 637 114). In IRAS 08572+3915 (top) PAH emission, which should be visible if there is any star formation activity, is too weak to be observed. Instead, a strong absorption feature from carbon-based dust is observed at 3.4 μm. The natural explanation is a scenario where this galaxy’s luminosity is governed by an AGN obscured behind dust. 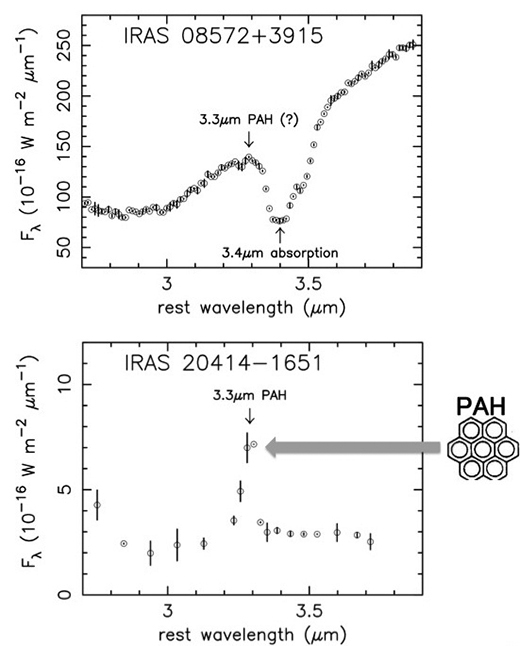 IRAS 20414-1651 (bottom) has strong PAH emissions at a wavelength of 3.3 μm, so it is thought that strong star formation activity may exist. IRAS 08572+3915, where the existence of a strong AGN buried deep in dust has been confirmed through infrared spectroscopic observations, was selected as a candidate for ALMA Cycle 0 and has been observed. We waited anxiously to see what differences between AGN and star formation activity would be revealed through comparisons of the strengths of the different molecular spectra in ALMA’s (sub) millimeter observational wavelength bands. In fact, we obtained results that are a different type from other star formation dominated infrared galaxies, with (sub) millimeter molecular spectra unique to a strong AGN buried in dust. We want to proceed and present to the world a reliable, independent method to determine the energy source for a galaxy by combining infrared and (sub) millimeter bands.